Did you know that there’s a product out there that can deter weeds, protect your soil and supply nutrients all in one? As the leading Portsmouth mulch supplier, we believe our product is the answer to perfect borders in your garden. With so many benefits to spreading mulch in your garden, contact us to start your journey to beautiful borders today. Mulch is a fantastic way to tidy up your garden. As a mulch supplier in Portsmouth, we specialise in using broken down wood chips, which are organic and biodegradable. This means they are a natural solution to your garden worries, and it avoids the potential harming factors of pesticides and spray-on chemicals. If you are too busy to water your garden, you can prolong the length of time before you have to get the hose out again with our Portsmouth mulch supplier service. The layer of mulch stops water from evaporating out of the soil and keeps moisture from draining away. You’ve spent the weekend weeding your garden, but a few weeks later you see the weeds have reappeared. As a mulch supplier in Portsmouth, we can supply you with high-quality mulch that is great at suppressing weeds. When there’s no sunlight, weeds don’t have the necessary conditions to grow. As a mulch supplier in Portsmouth, we understand that good soil texture is an enviable quality. When mulch is added as a top layer to your borders, it can be particularly beneficial to those that suffer with rocky soil, as it loosens the consistency and enables more room for roots to spread. Choose our mulch supplier Portsmouth to protect your plants from the heat of the sun. The RHS recommends spreading mulch late spring, as it can protect your young plants and roots from damage from the summer sun. Nutrients are essential for your soil. 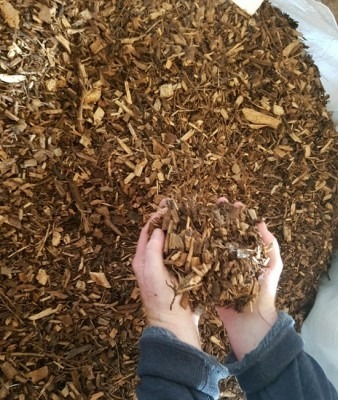 As a mulch supplier Portsmouth, we believe mulch is incredibly multipurpose and even when it biodegrades, adds huge amount of nutrients to your soil. Here at Abbey Turf, it’s not just our dedication to being a quality mulch supplier in Portsmouth that sets us apart from the crowd. We know that in order to have a healthy, well looked after garden, there are many different factors you need to consider. As quality mulch suppliers in Portsmouth, we use our mulch in all our landscaping services. Whether you just need our help by using our Portsmouth mulch supplier service, or you need to use our design to construction landscaping service, Abbey Turf is here to help with all of your gardening needs. How does choosing Abbey Turf benefit you? With so many benefits in one product, it’s no wonder our mulch supplier Portsmouth services are in high demand. Part of creating your dream garden is committing to a timely maintenance schedule. As a leading mulch supplier in Portsmouth, we can reduce the time that you need to spend in your garden by using mulch as a prevention technique. Whether you need our mulch for domestic use, or you are a landscaper for much larger premises, we are happy to help and give advice should you need it. Have a look at our online gallery to see how our landscape and mulch supplier in Portsmouth services have benefited other people in the area. Whether you need a mulch supplier in Portsmouth, or you’re interested in any of our landscape services, contact us to find out more today.